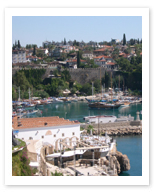 Kaleici, “inside the castle”, is the historic center of Antalya, located directly on its gorgeously rounded harbor. Now a protected historic zone, the area has been renovated and restored in recent years, and made more accessible to visitors. It is pretty easy to walk around the area, as many of the streets are now pedestrian-only. Kaleici offers a welcome chance to stroll and explore, and there are plenty of streetside and marina-side cafes at which to relax and enjoy the view with a cold glass of your favorite beverage.